Congratulations to this year's Business and Community Award Winners! The Greater McLean Chamber of Commerce invites you to join us Tuesday, October 6, 2015 at The Pavilions at Turkey Run celebrating McLean and our Business and Community Honorees. The vendors, sponsors, and award winners at Suits and Sneakers are your friends, colleagues, neighbors and fellow business professionals. Show your support for them by joining us on October 6. Individual tickets and sponsorship opportunities are on sale now! Please note: Vendor tables are limited and will be sold on a first come first served basis. For more information, call (703) 356-5424. A range of sponsorship opportunities exist to meet all budgets and marketing objectives. For more information on how your company can get involved, call (703) 356-5424. Come support your local business and community leaders who will be recognized for their outstanding community contributions! Your sponsorship/partnership provides you the opportunity to participate in recommending speakers, venues, and program topics. You can maximize your investment by publicizing the event with your clients, prospects, or members; inviting your family and friends to attend; and ensuring your organization has a presence at the event. 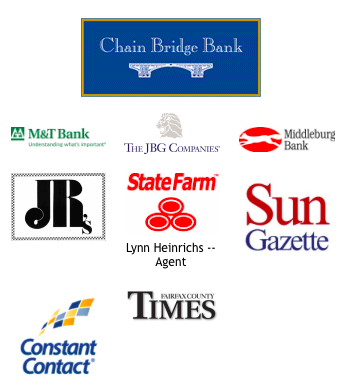 Your involvement is key to strengthening the success of your sponsorship/partnership investment with the Chamber.